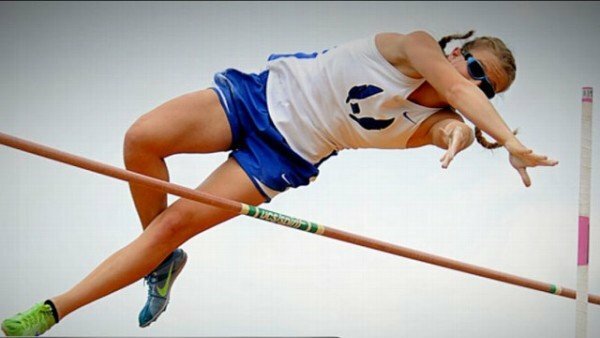 Blind pole vaulter Charlotte Brown has won a bronze medal in the Texas state high school championships on May 16. For three years, 17-year-old Charlotte Brown has been chasing a medal by trying to jump over a bar she couldn’t see. Charlotte Brown cleared 3.5m and was joined on the podium in Austin by her guide dog Vador. She had qualified for the state meet each year since 2013 with Emory Rains High School. She finished eighth as a sophomore and improved to fourth as a junior. Charlotte Brown developed cataracts at 16 weeks and had artificial lenses inserted, but her vision began to worsen aged 11 and she is now blind with only a “jigsaw puzzle” of light and dark shades. Despite her disability, Charlotte Brown takes pride in her fierce spirit of independence, born out of growing up in a family with two older brothers who pushed her to help herself in the rural town of Emory, about 76 miles east of Dallas. She first took up pole vaulting, which is not a Paralympic sport, in seventh grade because she wanted something a little “dangerous and exciting”. She counts the seven steps of her left foot on her approach, listening for the sound of a faint beeper placed on the mat that tells her when to plant the pole and push up.